Tegaki Sonic (手描きｿﾆｯｸ) is a 2D sidescroller platform game for mobile phones. The game features Sonic in a hand-drawn doodle style, reminiscent of Sonic 3 concept art, defeating badniks like Crabmeat as he advances his way though a drawn level. It was only available for the month of July 2010. 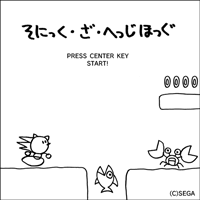 The title screen reads "Sonic the Hedgehog" (そにっく・ざ・へっじほっぐ) in Hiragana, handwritten phonetic Japanese, instead of of the more usual Katakana. It was released a year later for the iPhone in the West as part of the free Sonic 20th Anniversary application, as a sub-game titled Sonic the Sketchhog. This version is not a time limited download. The game plays very similarly to Sonic Runners with the sketchhog only going a certain speed right. Sonic also has the ability to double jump. As you progress through the stage the difficulty gets higher giving the player tricky jumps. In addition, there are rings which being hit by a enemy or falling in spikes loses all of them. In hard mode after, there will be instant kill bottomless pits. Falling down or getting hit with 0 rings will result in a game over. [] Chopper - Jumps up from the floor, spikes or pits. Enemy gives you one point under the ring counter. When you get a game over you're tallied from the number enemies you hit, rings you collected and how many meters you ran. The title screen takes from Sonic 4 Episode 1's title screen as a remix. In game plays a remix of Splash Hill Zone Act 1, its plays faster in Very Hard mode onward. This page was last edited on 8 April 2018, at 07:50.